It won't have escaped your notice that I've been sewing trousers recently (here and here), and I have just finished another pair of Emerson/Alexandria mash ups which have yet to be posted. I've talked and thought a lot about sewing trousers in the past, but never really managed to actually do the sewing. Suddenly I can't get enough! I think there are a few reasons for this. Firstly, I'm just wearing trousers more. Generally casually, I live in skinny jeans and at work wear more dresses and skirts, but this winter I've definitely been wearing my RTW black skinnies to death. I'm not sure what's prompted this change and I suspect that come summer (IF summer ever cometh) that my skirts my come back out to play, but for now I want to wear trouser. Secondly, I tried on quite a few RTW trousers and didn't like them. The fit was OK, but not good enough, and I figured I could at least attempt to do better myself. Thirdly, the more you make trousers, the less scary they seem. Actually trousers are not difficult at all to make. Just hard to fit. Lastly, there seems to have been an explosion of Indie trouser patterns in the past few years, which makes the whole thing easier still, albeit with some limitations (see below). What I will say though, is that I am fussy about the shapes and styles that I wear, and none more so than trousers. I can't always put my finger on what I don't like about things, I just know they aren't right for me, and sadly from the sewing point of view, often I can't identify this until I've actually tried them on. Case in point the Alexandria pants and more recently the Calyers, which I muslined and then rejected (same problem with fabric volume as the Alexandria). This quickly becomes an expensive hobby (the Calyer pdf cost £10), so I am trying to come up with some ways to identify whether a pattern is likely to be a winner or not, BEFORE I make the purchase. This still needs some work, but in the meantime, I thought I'd share some lovely trouser inspiration with you. This is by no means an exhaustive list, but it's some of the patterns I have my eye on currently, in that "my eyes are bigger than my sewing ability" way we all know. I love the cropped wide leg look, and am keen to recreate a pair I tried on in Jigsaw a couple of months ago but didn't buy because they were dry-clean only and itchy wool. This is a selection of patterns I've been considering. I have previously made and do like the True Bias Emerson pants (not pictured), but would like to move away from an elasticated waistband. 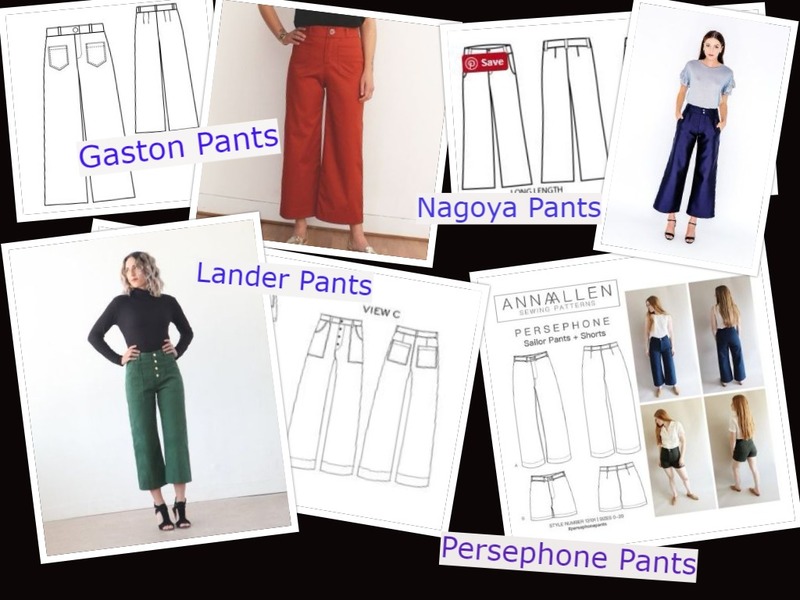 I think I like the Anna Allen Persephone and RDC Gaston's best, due to the covered fly and the slightly wider leg, but the others, the True Bias Lander Pants and the Papercut Nagoya Pants are strong contenders. I prefer that the Lander has back pockets, but they are easy things to add to a different pattern. I'd like to make a black pair for work (fabric tbc, but maybe a canvas?) and also a pair in denim. I LOVE Novita's version of the Persephones. So gorgeous. Aside: I mentioned above about elastic waists. 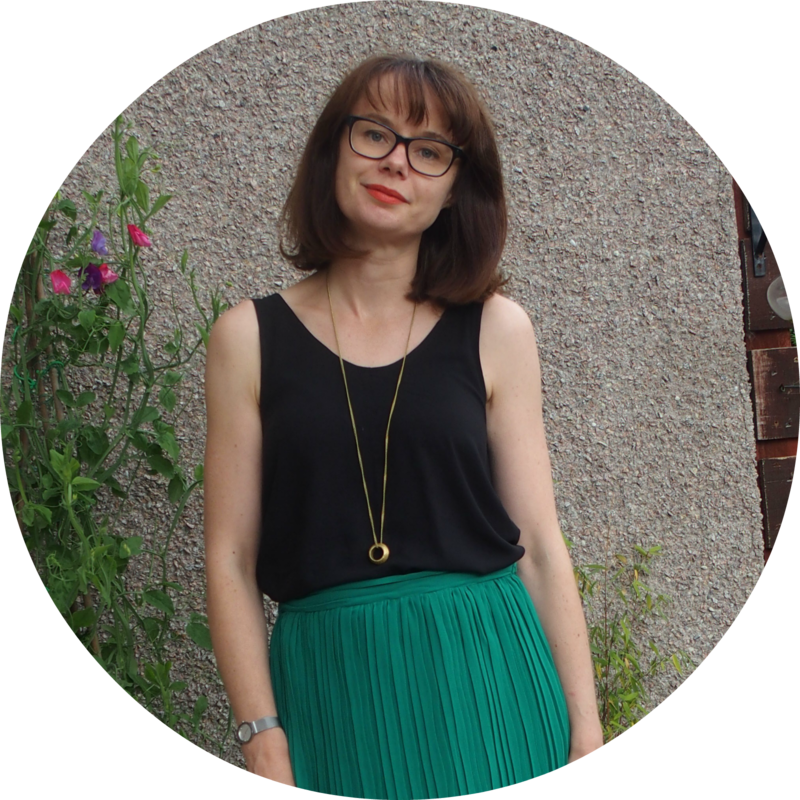 I actually never thought I'd write this, but I have nothing against elastic waists per se, however there are a lot of Indie trouser patterns out there with elastic waists, whether full or back only, and I'm wondering why. They are definitely easier to sew, so perhaps easier to tempt trouser-making newbies in (plus since elastic waists go with baggier trousers, less potential fitting to be scared of? ), but given it's more than likely that most people will make skirts or dresses before they make the jump to trousers, they will have sewn darts and a zip or 2, making trousers with a side zip not insurmountable. Personally, with well written and illustrated instructions to follow, I don't find a fly that difficult either. Do pattern designers themselves dislike fly front or side/back zip trousers and assume their customers feel the same? Or do they actually want to avoid writing the instructions, which I can imagine are probably difficult to describe for a fly zip, and while there are some very good tutorials out there, you can't really produce a pattern and then direct your customer to someone else's tutorial. Or, actually, is it just that elastic waists are trendier/have become more socially acceptable in recent years? I have no idea, and I have no strong feelings about it. It's just something that I've been thinking about since I've been looking for some patterns without an elastic waist. Obviously I've made a few peg leg and pleated trousers with some mixed results. I REALLY love teh look of them, but I struggle with the wearing of them. My successes have all been with the pleats of the Emerson, which are pretty shallow and short. This combination doesn't seem to give me the excess at the front crotch and thigh area, which I find problematic. This is why I think the Orangeuse Patterns Bruges Trousers might work for me. I'm not convinced by the side stripe on the legs, but that's optional, and I really like the rest of the pattern. No back pockets again, but I'm sure I could add welt pockets (she said, never having sewn welt pockets in her life). 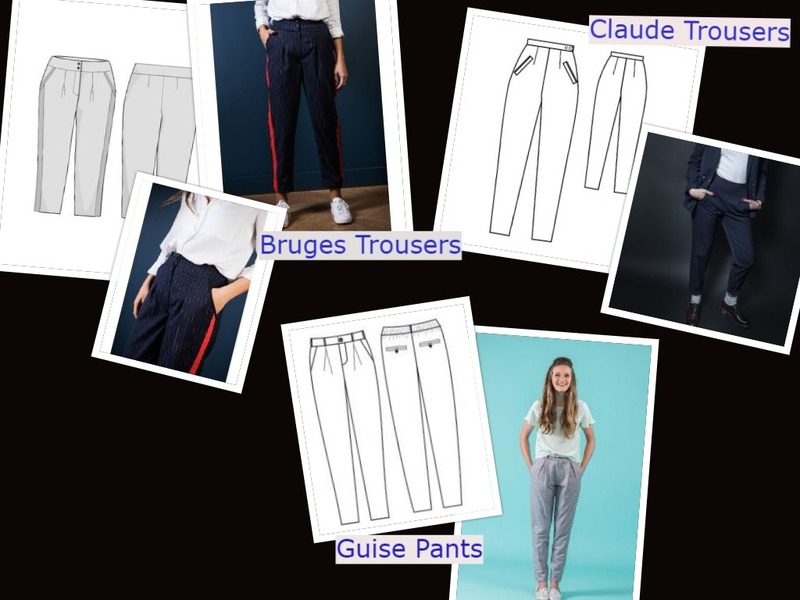 The RDC Claude Trousers interest me, but they look quite different depending on the version you see. I do like the versions that Christine has made here and here. I even dreamed about them (true story)! Finally the Papercut Patterns Guise Pants. I really wish these weren't elasticated at the back, but I suspect the pleats are probably going to be a problem anyway, so it's highly unlikely I'd make these. But they look nice, don't they? Dead easy to wear, there will be room in my wardrobe for skinnies for a while yet. 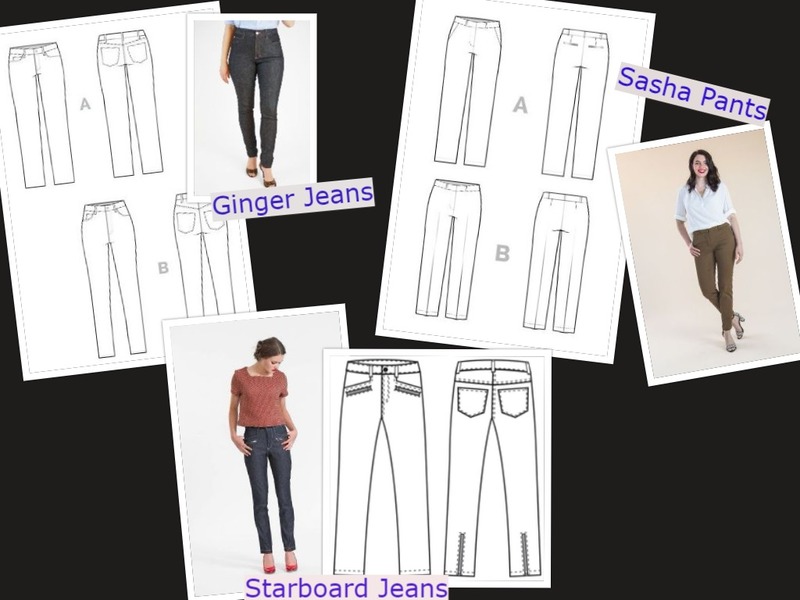 I've been meaning to make the Closet Case Ginger jeans for a while, I have the pattern and one of my RTW pairs has just gone through at the knee, so it's inevitable they wiill happen. If I like them, I might also try the Sashas which are made from the same block. I chucked the Papercut Patterns Starboard jeans on there too as it has some interesting details. I've been a bit obsessed with the Elizabeth Suzann Clyde Pants for a while. They have an elasticated waist, so I might not actually like them on me, but I love the drafting. No side seam with a capacious scoop shape pocket and a tapered leg. I even like this weird khaki colour. Unfortunately they are RTW, sold in the US and out of my price range. 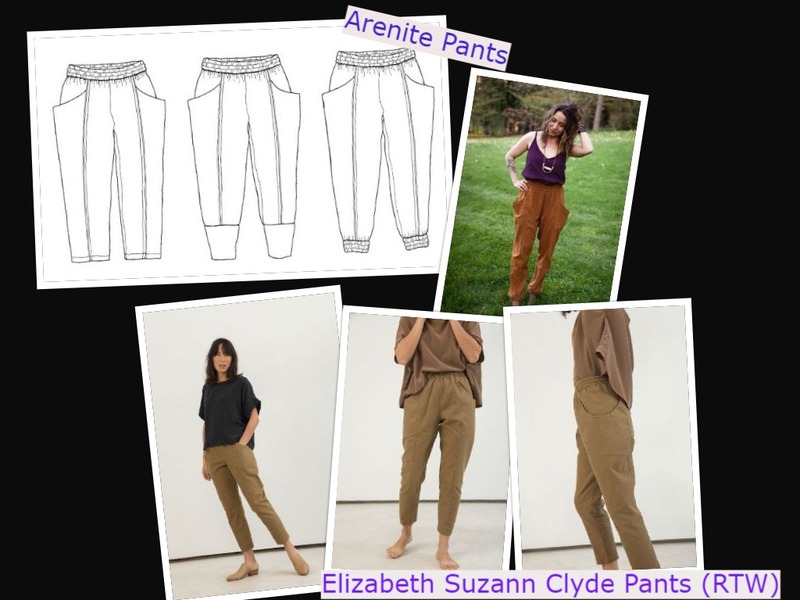 I recently came across the Sew Liberated Arenite Pants on Instagram and while I wouldn't wear this slouchy, relaxed shape, it has a lot in common with the Clyde pants. So much so, that I am considering buying the pattern to hack. I'm not sure how easy it would be to do with no side seams, but if I could reduce the ease enough, it could work. It's not a priority, but it would be an interesting experiment. So many pants, so little time. I have been liking stretch jeans and back elastic because they allow my stomach to expand a little without hurting but I don't think you need this. ;) I am happy I had excellent intructions for my first zipped fly or I might still be intimidated. It is slightly difficult to get zippers of just the right length (or trying to shorten some of them) so maybe that's why they aren't as common? Thanks Kathleen. I wasn't aware of that pattern. It does look nice! On the point about elasticated waistbands (either whole or part), I've noticed lots of them in RTW recently - I mostly buy trousers in Uniqlo and COS, but both of them have a fair amount of elaticated waistbands. I'm all for it - makes me sound old, but I do like the comfort factor! Thanks Shivani. I don't particularly enjoy the fitting, which may also be why I'm quick to dismiss patterns, but I do enjoy sewing trousers. And good point re RTW. I ordered Uniqlo trousers recently and was surprised that they had an elastic back waistband. They didn't fit, so went back, but they were comfy. Great roundup! I saw someone on Instagram hack the style Arc Tully trousers to be similar to the Clyde pants.... it was Luigiwu! nice collection really very impressive. We are manufacturers and suppliers of ladies clothing.